With the salon settled and the decanters refilled after festivities it's time for me to take up my quill and once again return to chronicling the glorious Georgian era. Our first guest of a new year is a French lady of the theatre and a true star of the era. Marie Françoise Dumesnil was born in Paris to an impoverished yet noble family and developed an early love of the stage. 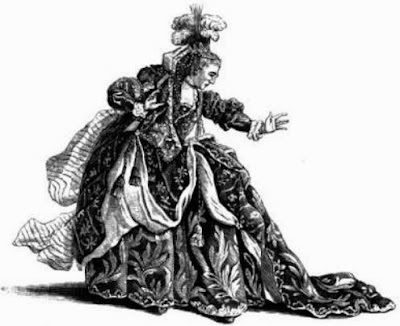 Determined to pursue a theatrical career she took to the stages of provincial France and in 1737 was called to make her Parisian debut with the Comédie-Française. Her performance as Clytemnestre was highly acclaimed and Dumesnil stayed with the Comédie-Française until she eventually retired nearly thirty years later. Noted for her naturalistic performances and nuanced dramatic performances, Dumesnil enjoyed the acclaim of public, critics and playwrights alike and her comedic roles were the toast of the capital. However, Dumesnil made an enemy in her rival leading lady, La Clairon, a conflict that rankled with the actress. Three years before her death Dumesnil authorised an official biography, Mémoire de Marie Françoise Dumesnil, en réponse aux mémoires d'Hippolyte Clairon, in which she finally defended herself again La Clairon's attacks on her performances and methods. She was one of the brightest stars of the French stage and her instinctive approach to acting was highly influential at the time; as well as the respect of most of her peers she was one of the most popular and successful actresses of her era and her retirement was the cause of much disappointment among the public who flocked to see her. Despite her years away from the spotlight her memoirs sold well, no doubt to those who had been starved of her performances for far too long! Who was her equal at the time on the English stage,Madame? Hmmm... Off the top of my head I am minded to say Christiana Horton. Incidentally I received a beautiful book about 18th century actresses for Christmas, this gives me a wonderful excuse to read it!